Here we have an image of a sheet of paper from an artist sketch pad pinned down on a table by four drawing pins, one in each corner to hold the paper in place to stop it from moving. On top of this paper you can see a pair of hands attached to blue cuffs from a shirt and each hand is holding a drawing pencil. 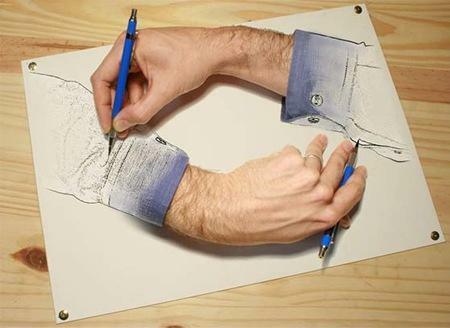 This optical illusion gives the appearance that both hands are real flesh and blood while at the same time they are both drawing the blue shirt cuffs that are attached to each other. That is clearly a real hand...explain hthe hand and pen on top that are clearly not even on the white paper. Though at first glance they appear identical, when you study them closely one can clearly note the differences. Thus one can then clearly identify the real hand.